Hanoi (VNA) – A state-level funeral was held at the National Funeral Hall, No.5 Tran Thanh Tong, Hanoi, on April 10 for Lieut. Gen. Dong Sy Nguyen, former Politburo member, former Vice Chairman of the Ministers’ Council and former Commander of Truong Son Corps. Many delegations came to pay their last respects to the general, who passed away at the age of 96 on April 4 after a period of serious illness. Party General Secretary and President Nguyen Phu Trong, Prime Minister Nguyen Xuan Phuc, National Assembly Chairwoman Nguyen Thi Kim Ngan and President of the Vietnam Fatherland Front (VFF) Central Committee Tran Thanh Man led the respective delegations of the Communist Party of Vietnam Central Committee, the Government, the National Assembly and the VFF Central Committee to pay homage to the late officer. Other mourners included former Party General Secretary Nong Duc Manh, former President Truong Tan Sang, former Prime Minister Nguyen Tan Dung, former NA Chairmen Nguyen Van An and Nguyen Sinh Hung, and other incumbent and former leaders of the Party and State, and veteran revolutionaries. Former Party General Secretary Le Kha Phieu and former Presidents Tran Duc Luong and Nguyen Minh Triet sent wreaths to the event. Joining the line of mourners were delegations of the Party Central Committee’s Commission for Information and Education, the Ministry of Foreign Affairs, the Ministry of Public Security, the Defence Ministry, the Central Military Commission, the Party Central Committee’s Commission for Internal Affairs, and the Party Central Committee’s Commission for Mass Mobilisation. Representatives of the Party Committee, People’s Committee, People’s Council and Fatherland Front Committee of the central province of Quang Binh – Dong Sy Nguyen’s homeland - along with many leaders of ministries, agencies and organisations at both central and local levels also came to pay tribute to him. 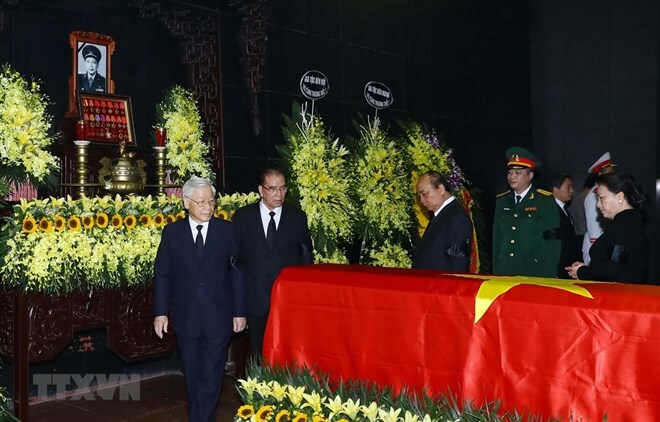 Writing in the funeral guest book, Party General Secretary and President Nguyen Phu Trong expressed his deep grief over the death of the prestigious leader of the Party, State and people. He praised Dong Sy Nguyen as a loyal and creative communist soldier who made great contributions to the cause of national liberation and reunification, as well as to the national construction and defence. Meanwhile, Prime Minister Nguyen Xuan Phuc wrote, “With more than 80 years of Party membership, comrade Dong Sy Nguyen has devoted his entire life to the revolutionary cause of the Party and the nation”. The comrade always excellently fulfilled the tasks entrusted by the Party, State, Army and People in any position. His name and career was especially associated with the legendary Ho Chi Minh Trail,” he added. National Assembly Chairwoman Nguyen Thi Kim Ngan expressed her deep sorrow at the death of comrade Dong Sy Nguyen, who remarkably contributed to the NA during the first tenure term over 70 years ago. The same day, the memorial service and burial ceremony for general Dong Sy Nguyen took place at the Vinh Hang Cemetery in Ha Noi's Ba Vi district. Dong Sy Nguyen (birth name Nguyen Huu Vu, alias Nguyen Van Dong) was born on March 1, 1923 in Quang Trung commune of Quang Trach district, the central province of Quang Binh. He began participating in revolutionary activities in 1938 and was admitted to the Party in December 1939. Nguyen served as a member of the Party Central Committee in the fourth, fifth, and sixth tenures; an alternate member of the Politburo in the fifth tenure; and a member of the Politburo in the sixth tenure. He was former Commander of High Command 559 which opened and operated the Ho Chi Minh Trail during the war; Political Commissar and Secretary of the High Command 559’s Party Committee; Secretary of the Party Committee of the advisors’ group and Commander of volunteer soldiers in the central and lower Laos; Deputy Minister of National Defence; Minister of Construction; Minister of Transport; Vice Chairman of the Ministers’ Council (a position now titled as Deputy Prime Minister); and a deputy of the National Assembly in the first, sixth, seventh, and eighth tenures.